Brexit: A new deadline of Oct. 31 – Macron wanted to be tougher! After a tense and long meeting, European leaders offered the UK another Brexit extension until Oct. 31 to negotiate its exit from the European Union. The UK will now take part in the EU elections and assuming parliament approves, they will form a new deal to leave on Halloween. The decision was the result of a high-stakes, six-hour summit in Brussels that saw prime ministers and presidents gather from across the continent to determine Britain’s fate. The prime minister was asked to leave the room while all the other EU leaders discussed whether to delay Brexit. President Macron was vehemently opposed to giving a longer extension, and his narrative was to push the UK out sooner. reports suggest there was a disagreement between France and Germany over the length of the delay. The UK must prepare and present a deal by the end of June which will be used as a review date to determine the progress of any negotiations. This might enable Britain to terminate the extension early if its lawmakers have agreed on an exit deal by then. Prime Minister Theresa May must decide whether to accept the offer. 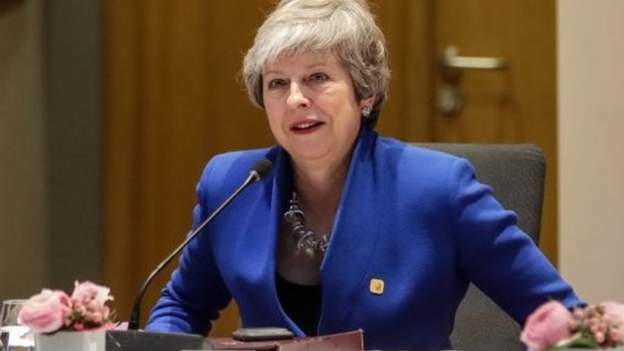 Eager to deliver Brexit as soon as possible, she wanted a shorter extension and has vowed not to accept any delay that goes beyond June 30. However, if she declines, Britain will be facing a “no-deal” Brexit on Friday. While this scenario does have its supporters, most experts warn it could damage the economy, bring food shortages, and risk conflict in Northern Ireland. The EU has strategically, used the 31st October, to provide enough time and impetus for parliament to call for a referendum or at least change leadership. Something they weren’t able to do with the time constraints prior to this. Some analysts believe, Theresa May is on her way out, this gives enough time and opportunity to mount a leadership challenge and if half her cabinet resigns the government will collapse. Support our free Journalism with a one-off donation – People like you make WTX possible – Thank you! Netanyahu claims Trump is his man! Planet in crisis but who really cares? Emma Thompson joins the Extinction rebellion as Police move in! The ​Daily Brief from WTX News​ - An exclusive briefing service, tailored to provide you with summaries of all the latest national and international news; a snapshot of handpicked headlines with all the links delivered direct to you. We call it perspective - no wishy-washy agendas, no propaganda. Copyright © 2018 WTX News powered by Karam Media 2018.